Saturday, February 2, Full Snow Moon Gathering, Great Falls Discovery Center, 2 Avenue A, Turners Falls, MA. “An Island Perspective on Wampum”. 11 a.m. to noon. 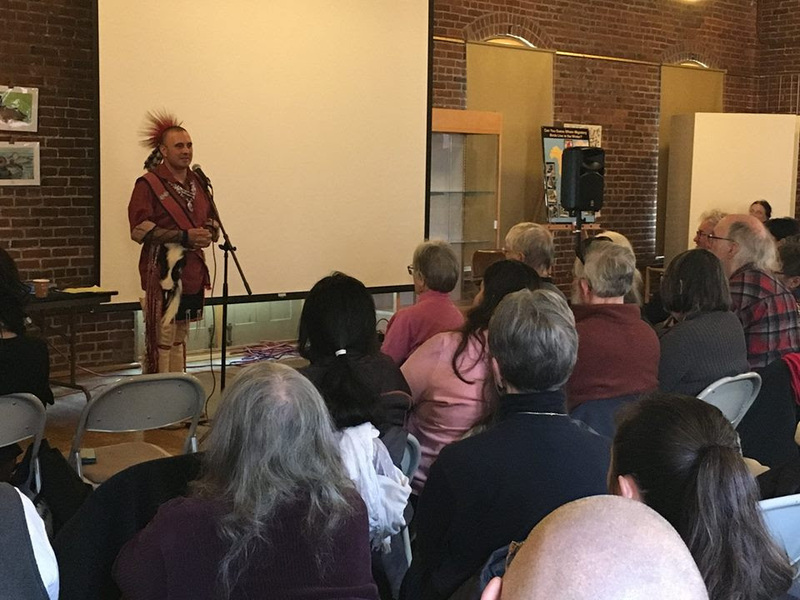 Join Aquinnah Wampanoag Researcher and Artist Elizabeth James-Perry of Original Wampum Art for an informative presentation focused on historic wampum arts, including adornment, diplomacy and record keeping from the perspective of a Native woman, which will include a demonstration of wampum weaving. Free. All welcome. 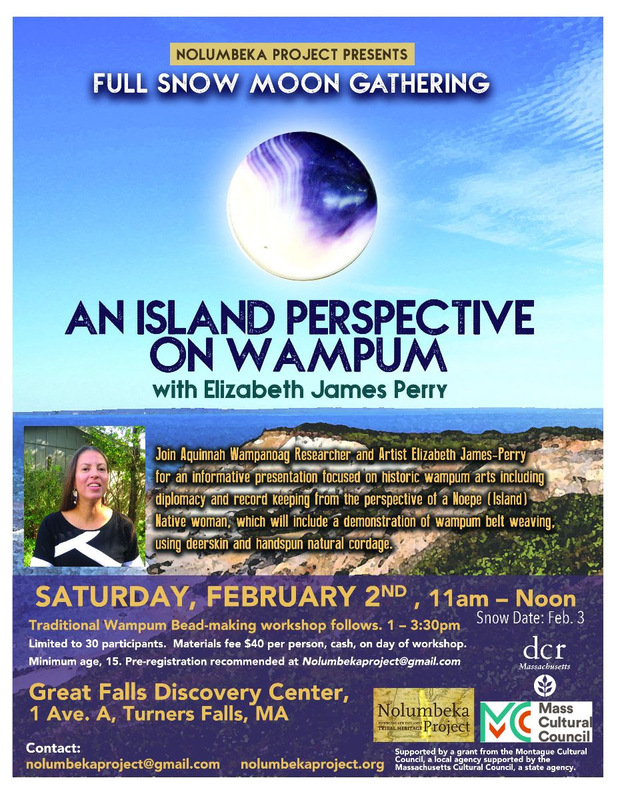 Elizabeth will bring a display of her wampum jewelry for sale. Elizabeth James-Perry is enrolled with the Wampanoag Tribe of Gay Head -Aquinnah, a community located by the richly colored clay cliffs of Noepe (Martha’s Vineyard). She is a contemporary and traditional artist, speaker and exhibit consultant. She continues the work of her many tribal mentors to shore up culture, through museum and archival research in local and international collections. In her creative process, Elizabeth focuses on early Northeastern Woodlands Native American culture, including traditional regalia, diplomacy and ancient wampum design. The artist explores the rich purple hues of the quahog shell in designing jewelry, sculpturing whale and bear effigies; and making fine beads to weave the luxurious drape of collars and belts. She has revived traditional coastal plant dyes, using them to create museum-quality textile arts in milkweed and woven quillwork. Elizabeth’s art has received national recognition; earning awards at the Heard Museum Art Show; as well as the 2014 Traditional Arts Fellowship from the Massachusetts Cultural Council. Weather concerns? Check www.nolumbekaproject.org for cancellation. Snow date, February 3, 2019. 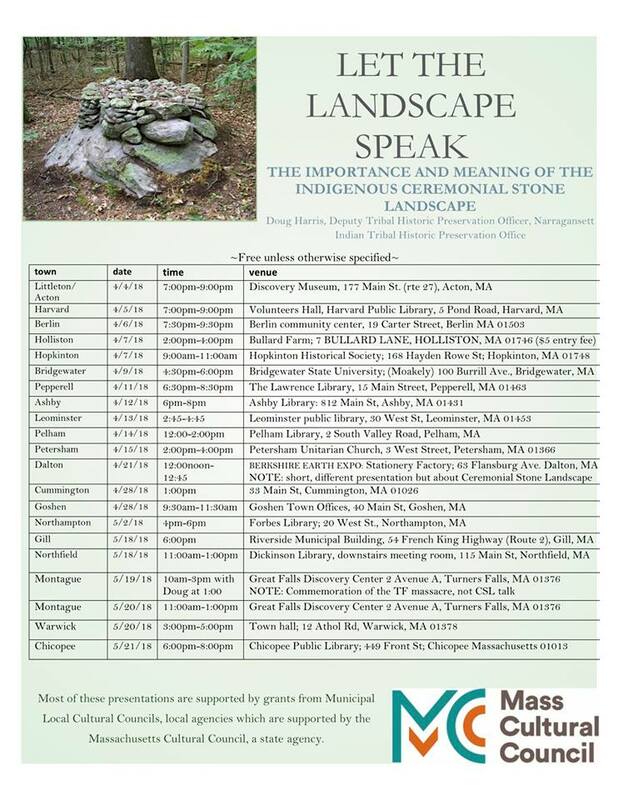 Co-sponsored by DCR and a grant from the Montague Cultural Council, a local agency supported by the Massachusetts Cultural Council, a state agency. A discussion with Lisa Brooks, PhD, “Our Beloved Kin”, and Christine Delucia, PhD, “Memory Lands”. Noted historian Christine DeLucia offers a major reconsideration of the violent seventeenth-century conflict in northeastern America known as “King Philip’s War,” providing an alternative to “Pilgrim-centric” narratives that have conventionally dominated the histories of colonial New England. DeLucia grounds her study of one of the most devastating conflicts between Native Americans and European settlers in early America in five specific places that were directly affected by the crisis, spanning the Northeast as well as the Atlantic World. She examines the war’s effects on the everyday lives and collective mentalities of the region’s diverse Native and Euro-American communities over the course of several centuries, focusing on persistent struggles over land and water, sovereignty, resistance, cultural memory, and intercultural interactions. 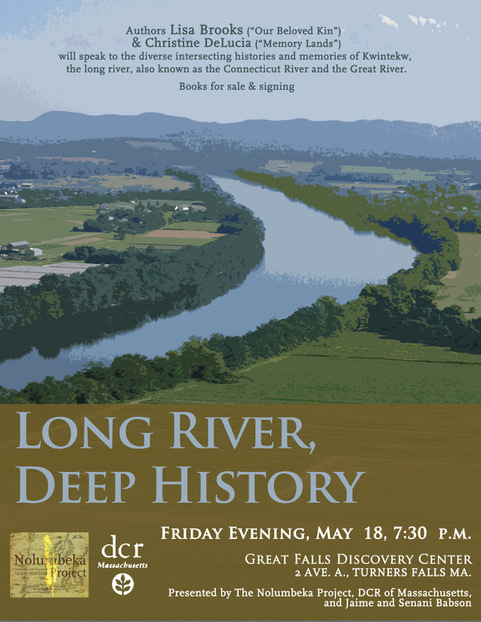 An enlightening work that draws from oral traditions, archival traces, material and visual culture, archaeology, literature, and environmental studies, this study reassesses the nature and enduring legacies of a watershed historical event. This event is co-sponsored by Greenfield Community College, the Nolumbeka Project, and World Eye Bookshop. Christine M. DeLucia is assistant professor of history at Mount Holyoke College. She grew up in Amoskeag/Manchester, New Hampshire, and presently lives in South Hadley, Massachusetts, in the heart of the Kwinitekw/Connecticut River Valley. “A remarkable ‘reopening’ of the history of New England. Christine DeLucia turns our attention to the ‘memoryscapes’ in our midst, demanding reconsideration of the markers, monuments, objects and placeworlds that memorialize King Philip’s War, alongside the processes that alternatively repress and recover Indigenous histories of survivance.” —Lisa Brooks, author of The Common Pot: the Recovery of Native Space in the Northeast and Our Beloved Kin. Copies of “Memory Lands” will be available at the event or call World Eye Bookshop (413-772-2186) to reserve. 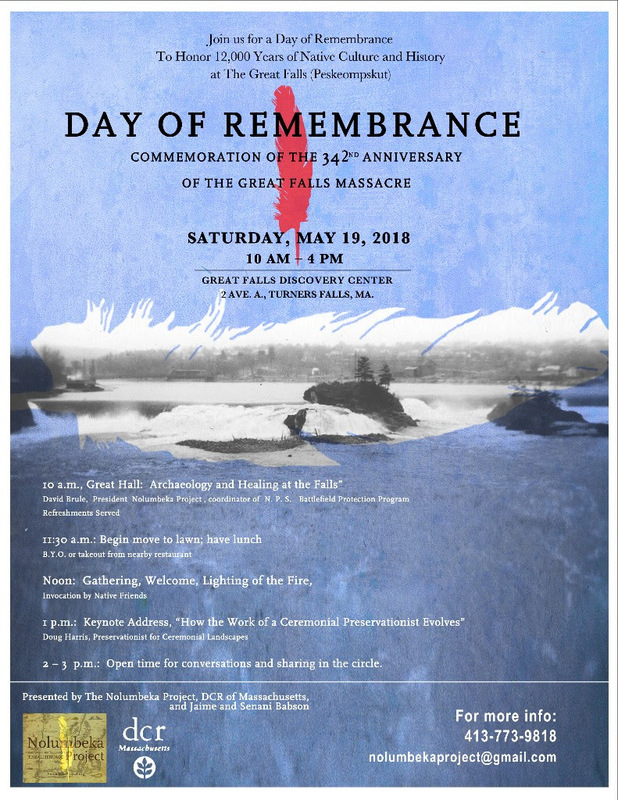 Please note that the May 19th appearance with Doug Harris is part of the Day of Remembrance Commemoration of the 342nd Anniversary of the Great Falls Massacre and the 14th Anniversary of the Reconciliation Ceremony between the Narragansett and the Town of Montague. 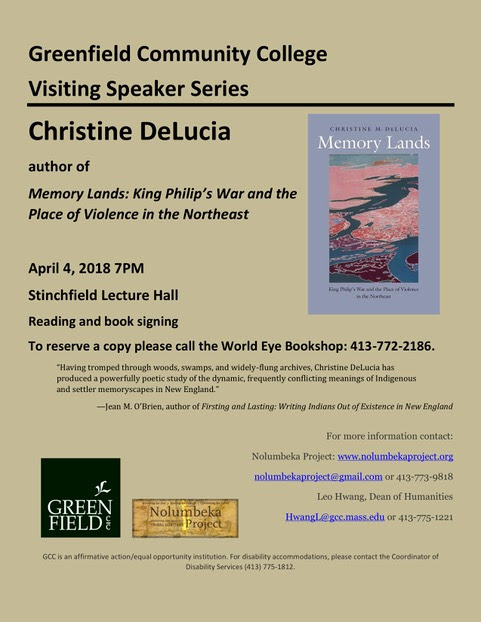 The evening before, May 18, 7:30 p.m., our special guests will be authors Lisa Brooks and Christine DeLucia whose books about King Philip’s War were recently published. Read more on our website, www.nolumbekaproject.org. Reminder: Christine DeLucia will be giving a presentation at GCC on Wednesday, April 4, at 7 p.m. More on website and Facebook.